This will be a match where tactics and formations take a back seat to desire and determination. Much has been made of Inter’s expected mid-winter collapse wherein the Nerazzurri have, over the past half decade or so, accustomed their supporters that whatever good work the side may have done from August to December, said good work will be wiped out by a mid-season collapse. So far, a draw against Sassuolo followed by back to back league losses to Torino and Bologna have left most Interisti pulling out what hair they have in trying to decipher what is wrong with their beloved Nerazzurri. There can be no doubt that captain Mauro Icardi is both out of form and out of sorts. Not only was his one-on-one miss last match indicative of a loss of form, but also his dejected body language and lack of running point to a player who has little motivation to give his all. However, there can be no better match where the traditional knight in shining armour comes riding to Inter’s rescue than this match, the question remains whether Icardi has the mental fortitude to set aside the off-pitch drama and deliver for his team. Not only have Parma beaten Inter in the first half of the season, they also come off an emphatic comeback draw against Juventus in their home in Turin. Coach Roberto D’Aversa will be more than optimistic when hosting the out of sorts Nerazzurri and will probably utilize the same tactics that won his side a point against the defending champions. Inter and their coach Luciano Spaletti must learn how to cope with compact defensive sides quickly. The Nerazzurri have struggled in their last three matches when facing weaker opposition but must not let their nerves get the better of them if they’re to realize ambitions. It’s looking bright for Keita Balde in terms his chances of making the squad for the match. Balde’s presence is welcome not only as an option for Spaletti coming off the bench, but also as a fire to ignite the desire in first-team replacement Ivan Perisic. Matteo Politano is still suspended so expect the under-performing Ivan Candreva to step in to replace the Italian forward. Borja Valero’s injury will also keep the Spaniard out of squad selection. Probable Inter line-up: (4-2-3-1): Handanovic; Soares, de Vrij, Skriniar, Asamoah; Vecino, Brozovic; Perisic, Nainggolan, Candreva; Icardi. Last Season: Not played as Parma were in Serie B. 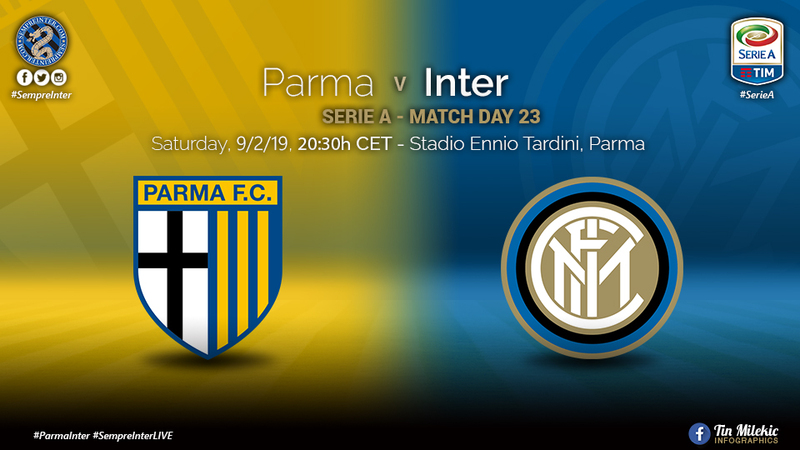 Last 10 Head to Head: Despite Parma being the far less successful side in Serie A history, they edge the Nerazzurri over the last ten league matches with five wins to Inter’s three victories. Ivan Perisic: Reports out of Appiano indicate that the Croatian winger has been working extra hard with Spaletti to try and regain his pre-World Cup form.There can be no doubt that on his day, Perisic is a world beating, unplayable winger; unfortunately his form since the Croatian World Cup heroic run has been patchy at best. Assistants: Lo Cicero and Cecconi. VAR Officials: Valeri and Vuoto. Prediction & scorers: Parma 1-2 Inter with Icardi and Perisic scoring. Concluding remarks: There can be no doubt that this match will be no walk in the park for Inter. Not only have Parma beaten Inter in Milano earlier this season, but the Gialloblu come into the match after having extracted a remarkable 3-3 draw from the jaws of the Allianz Stadium against the Champions Juventus in Turin.